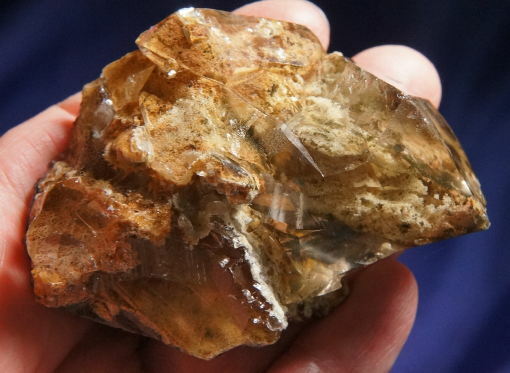 This is a beautiful unpolished elestial quartz from Brazil … 3.6 oz and 2.8” by 2.1” by 1.1”. She is most uncommon in that she is very clear, offering a perfect view of the incredible landscape inside – use a 10X loupe to see the full beauty of it all and see all the little manifestors sitting on her surfaces within! The landscape is actually a frothy blend of golden yellow, shades of russet, deep ochre, buff and gold lodelite, creating autumn garden features, all contained in that very clear quartz. She is healed or terminated all over - she is quite elestial and pristine! Her top is beautiful elestial terminations that enfold the visions within and offer unobstructed viewing. No matter what, you will delight in working with her as much as you will savor her beauty and grace! She has a few very tiny dings, but nothing that takes away from her message! This is a very personal crystal, the kind a Shaman would find and treasure and not share with another so that it was imprinted with his energies alone. When it was time to take an acolyte, only then would another touch it. This Spirit was treated with respect and only worked with when properly prepared. The Shaman would ritually wash and dry her, then smudge her with desert sage. He would then prepare himself with a bath, a fast and careful thoughts. When alone and in a sacred place, together, they would search and explore visions that would be later shared with the rest of the tribe. This is such a Spirit, ready for one who is prepared to make the journey with her.